I don’t know about you guys but I am so stoked to finally own a cast iron dutch oven! For years I’ve always wanted one because it’s versatile, durable, built to last and simply amazing. With a dutch oven, your meal options are endless. You can roast, braise, boil, stew, fry and even bake! For the amount of times I said “gawwddhhh I wish I had a dutch oven so I could make [enter dish]”, I’m actually amazed Kevin didn’t completely tune me out because I must have sounded like a broken record to him for years. I guess it finally stuck in his head, because last week he surprised me with a dutch oven for my birthday. I was completely shocked! Best present ever!!! This dutch oven is officially my new obsession. Sorry Kevin. 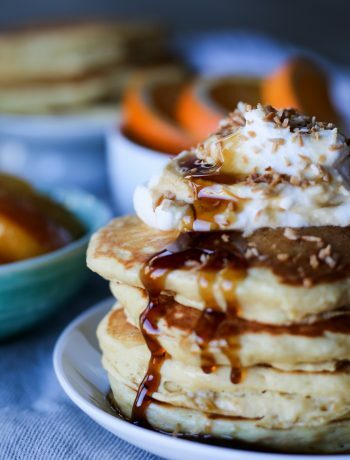 The great thing about this recipe is that you don’t need to slave away in the kitchen all day. There is of course some work you need to do (browning, sautéing, etc. ), but after that you can kick back your feet and let the dutch oven do its magic. The low and slow cooking method allows the meat’s connective tissue to break down in the delicious wine and tomato flavour base resulting in meat that is so fall-off-the-bone tender and flavourful. 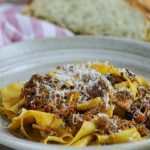 I personally think that ragu is best served over wide noodles such as pappardelle and it’s even better if the pasta is homemade. Making pasta isn’t that hard and honestly it doesn’t take long either. The only pasta I buy from the store now are shells, mainly because I haven’t explored making other pasta shapes just yet. I have however finally tried rolling pasta sheets using the loop method. I don’t know why it took me so long to figure this out, but rolling has become soooo much easier now and to top it off I end up with even pasta sheets! I ended up serving the ragu alongside some homemade roasted garlic and rosemary bread baked in – you guessed it – my dutch oven. 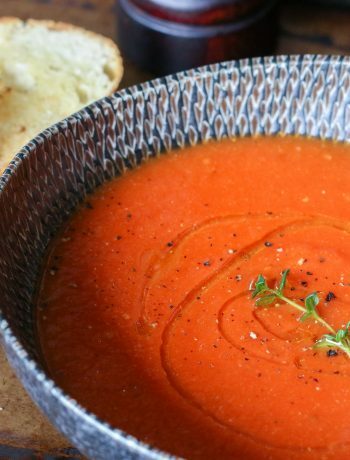 I can’t say enough how amazingly simple yet delicious this recipe is. You’ll definitely receive some oohs and aahs if you make this for your family or dinner guests. 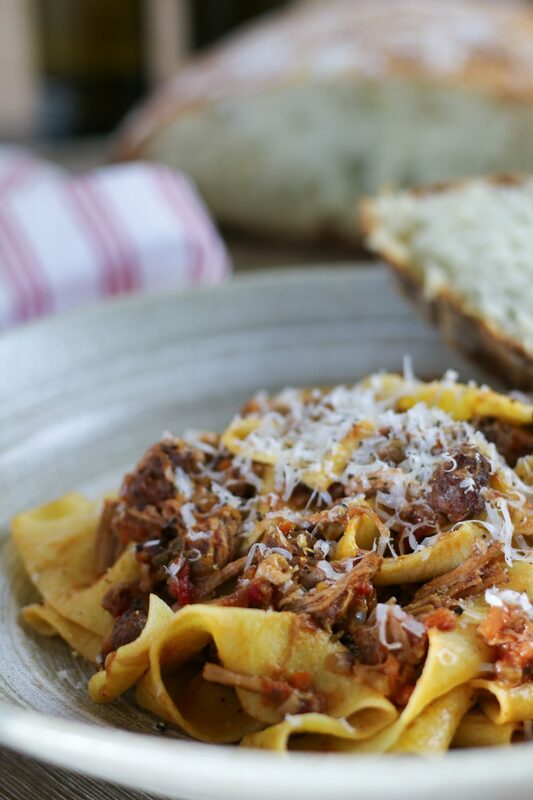 This braised pork shoulder and spicy Italian sausage ragu is a one-pot wonder that will have your guests thinking you slaved away in the kitchen all day. Season the pork shoulder with salt and pepper. Place a cast iron dutch oven (or heavy bottomed pot) over medium-high heat and add oil to cover the bottom. When hot, add the pork to the pot and brown on all sides, about 5 minutes per side. Remove the pork from the pot and reserve. Reduce the heat to medium and crumble the sausage into the pot. Sauté for about 6 minutes, breaking up any large chunks, until there is no more pink remaining. Remove the sausage from the pot and set aside. Reduce heat to medium-low and add onion, carrot, celery, garlic, rosemary, thyme, sage, bay leaves, and chili to the pot. Sauté the vegetables for about 10 minutes. Add tomato paste and stir. Pour in the wine and simmer until reduced by half. Place the pork and sausage back into the pot and pour in the can of tomatoes. Reduce the heat to low, cover and let simmer for 4 hours, turning every hour or so. Carefully remove the pork from the pot and place on a cutting board. Using two forks, shred the pork into bite size pieces (discard the fat and bones). Return the shredded pork into the pot and taste for seasoning (add salt and pepper if needed). Bring a large pot of water to boil and add salt. Add the pasta and cook until al dente. Drain and reserve. Transfer the pasta to plates, top with additional ragu, grated parmesan, and freshly cracked black pepper. You can make the ragu sauce a day in advance, just heat before serving and add some pasta water to loosen up the ragu sauce. 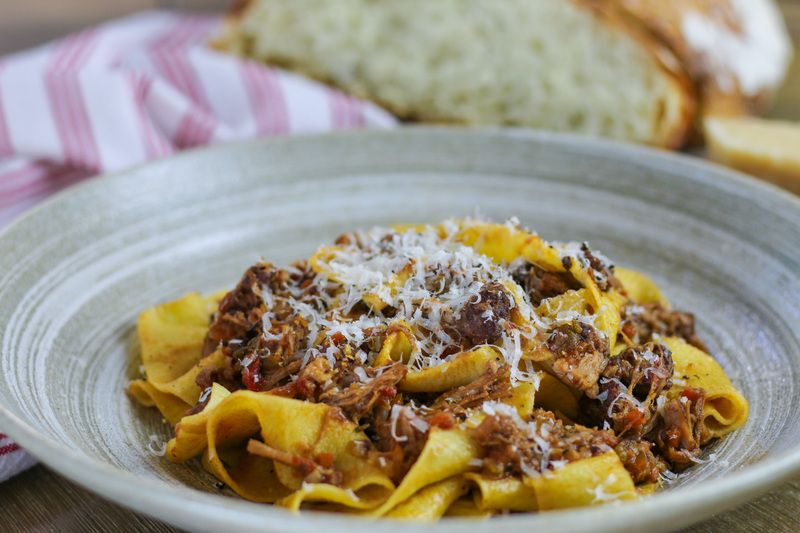 This ragu sauce can be kept in the freezer and reheated when needed.